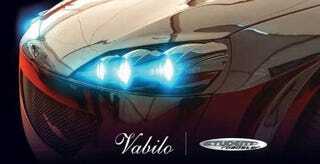 Thanks to the sleuthing of nicjasno last week after we tossed out pics of a mysterious roadster snapped in Slovenia, we now know it's called the Vabilo. What we don't understand is practically everything else. Is the group called "Student roadster" a company or a student group? Why is their website headlined in English and everything else is in some damn furiner language? Aside from those questions the only one remaining for us is "why?" This one is central for us as it actually is pretty neat looking and may offer something interesting in the roadster market. We've got a couple of teaser shots of the car but we'll just have to see if we can figure out how to get more later.